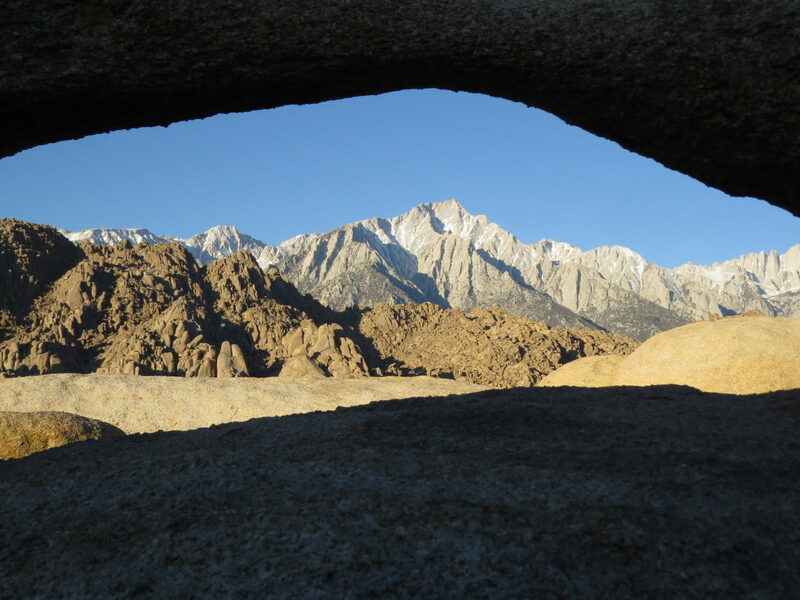 Lathe Arch, though less famous than Mobius Arch, rests in the Alabama Hills of southern California and provides unique opportunities as a portal through which to view the sheer eastern escarpment of the Sierra Nevada Range. Depending on the angle, one can focus on Mt. Whitney, or, alternatively, shift the focus to the peak that actually appears more prominent from this location: Lone Pine Peak. In this photo, Lone Pine Peak dominates the background, while boulders of the Alabama Hills dot the landscape in the foreground. Adding to the drama, Lathe Arch remains in the shade, creating a dark frame for this surreal portal.